Thekkady is a nature lover's delight of unending chains of hills and spice scented plantations. Thekkady, with its unspoilt tropical forests and incredible wealth of animal and plant life is a naturalist’s paradise. The journey to Thekkady takes you through quaint little hill towns and softly contoured hill slopes surrounded by plantations of tea, coffee and spices like cardamom and pepper. 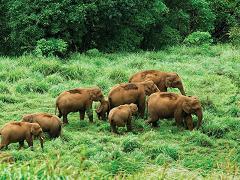 Thekkady is well known for the Periyar National Park and the elephants are the major attractions here. The climate in Thekkady is cool and pleasant in summers. The best time to visit Thekkady is from September to May. The temperature here ranges from 15 to 30 degree Celsius. Various picturesque plantations and hill towns that hold great opportunities for treks and mountain walks are spread throughout the area. Malayalam, Tamil, Hindi and English are the common languages which are spoken in Thekkady. The Mannans and the Palians are the native tribes of Thekkady. They live on the periphery of the Periyar National Park and maintain their traditional customs and beliefs, and depends entirely on the forest for their livelihood. The plantation tours are arranged by the District Tourism Information Office in Thekkady. In Kumily, various tours are organized which cover cardamom, pepper, coffee and tea plantations, tea factories, tribal settlements and the surrounding hill regions. The Forest Department at Thekkady also organizes elephant rides through the jungle. The tourists can take part in various activities in Thekkady like plantation tour, trekking, tea factory visit, visit to tribal village and boating. Boating on the Periyar lake at sunrise or sunset is an extraordinary one. The main trekking areas in Thekkady are located at Kurisumala near Kumily, Pullumedu, Ottakathalamedu and Grampi near Vandiperiyar. 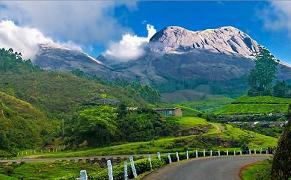 The nearest airports are located at Kochi and Munnar which are about 200 km and 90 kms respectively. The nearest railway station is located at Kottayam which is about 114 kms. Thekady can be easily reached from Cochin, Carmelia Haven, Munnar and Kumily.